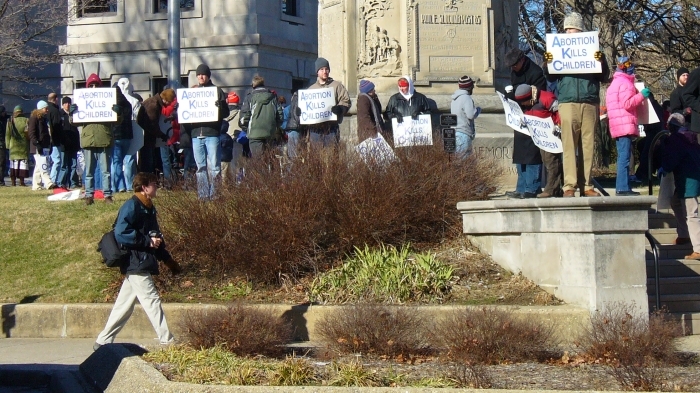 Nearly 200 people braved the bitter cold yesterday to make a firm statement to the community, state and nation: killing unborn children is terribly wicked and needs to stop. 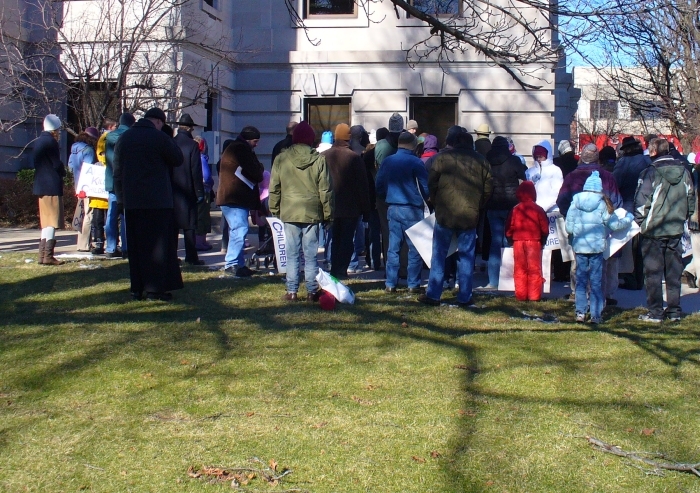 Organized by Monroe County Right to Life and the Pro-Life Committee of Church of the Good Shepherd, the 2008 Rally for Life drew 195 people. David Talcott opened the rally by explaining why we come to the county courthouse lawn every January to sadly remember the nearly 50 million unborn children who have been killed by America's abortion industry since the Supreme Court threw out state laws against abortion in 1973. As Christians, we have an obligation to be an advocate for those who have no voice of their own. 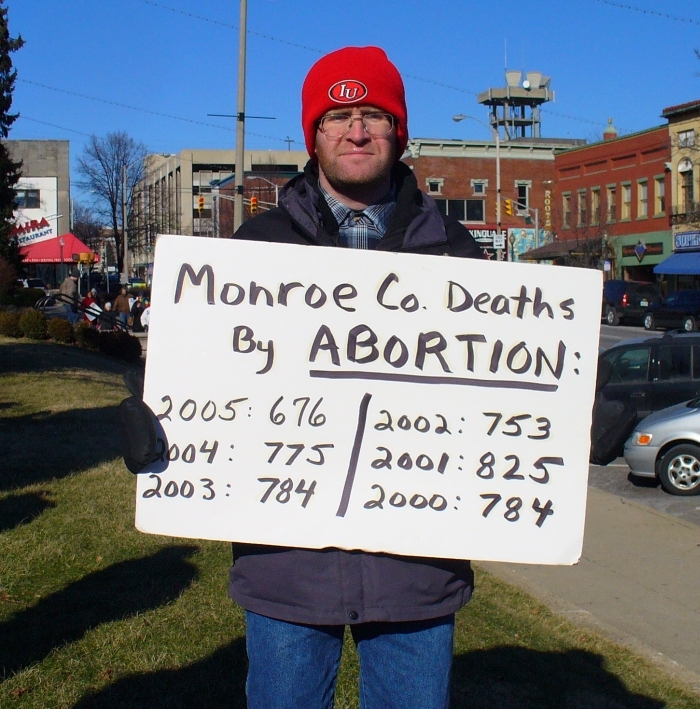 How many people in Bloomington and Monroe County have any idea that an average of 766 abortions have been performed here every year for the past 6 years? Do most people realize that an average of 14.7 babies have been killed per week in Bloomington over that 6-year period? Given these shocking numbers, how can the Bloomington City Council justify subsidy after subsidy to the local Planned Parenthood branch, which runs an abortion clinic on South College Avenue? Is forcing city taxpayers to subsidize an abortion clinic a "pro-choice" thing to do? 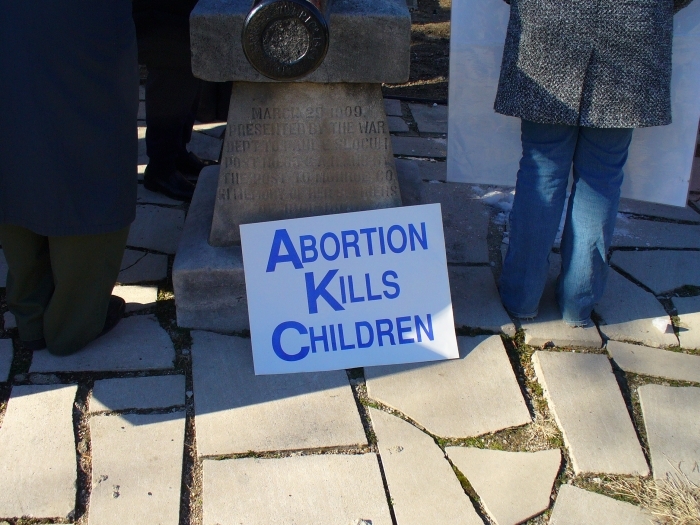 It is easy to feel isolated as an abortion opponent in Bloomington, Indiana, but the Rally for Life is an encouraging way to begin the year. Congratulations to the men and women who planned, advertised and executed the 2008 Rally for Life. It is encouraging to see policy makers there as well. Following is a thank you note I sent to State Representative Peggy Welch, D-Bloomington. Thank you very much for braving the bitter cold to attend today's Rally for Life. It means a lot to have a legislator there, especially given your record of looking past partisan loyalty toward what is right: protecting the unborn. You have been a consistent presence at the rally for years and your support for human rights is valuable. I appreciate your efforts and attendance today. Pro-Life activists witness to the community about abortion. The 2008 Rally for Life drew 195 people. People listen as David Talcott explains why we are here. A sign proclaims the truth. The numbers say it all.